Vurt: The Tabletop Roleplaying Game is an RPG based on the visionary and hallucinatory science fiction of author Jeff Noon (who won the Arthur C. Clarke Award for Vurt in 1994). Amid the glass-strewn streets of the lethal and anarchic Manchester England of the near future, players ingest slender Vurt feathers to travel to parallel worlds as vivid, unique, and unpredictable as our wildest dreams. But they’re no mere fantasies. These worlds - and all the wonders and horrors they contain - are as a real, and every bit as dangerous, as the one you were born in. 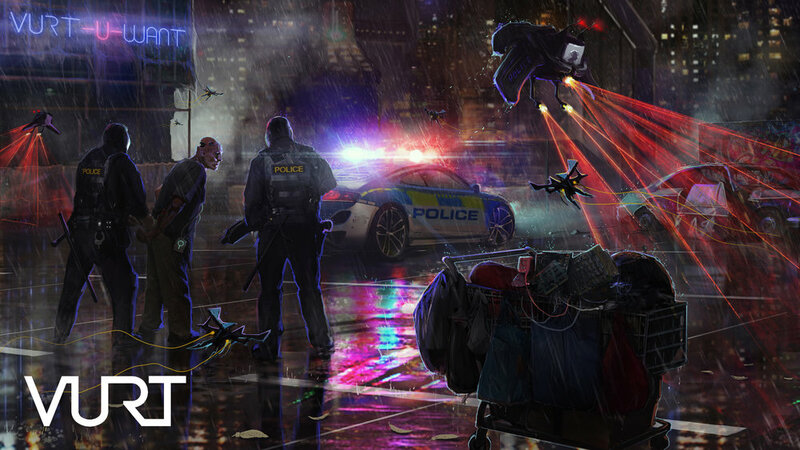 Vurt the RPG is a Cypher System game, and both the 426-page hardcover corebook and pdf contain the complete Cypher System rules, modified to bring the grittiness of cyberpunk streets and the vibrant freedom of dreams to your game sessions. That means that, other than pencil, paper and a couple of dice, the Vurt corebook is all you need to play the game. The Cypher System is the hugely popular rule set that powers Numenera and The Strange by Monte Cook Games. Ravendesk Games is very proud to be the first full licensee to bring a game to market using the Cypher System. The Vurt corebook has over 100 all new cyphers, loads of full adventures, a bestiary for both the real world and the vurt world, pregenerated characters and an enormous, 75-page setting chapter which delves with great detail into the boroughs and districts of Greater Manchester, the worlds largest megacity.